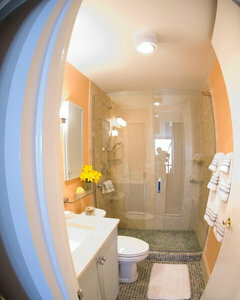 - I want to renovate my condo bathroom (the only one) I have room for a bath/shower (5 feet) or should I go with only a big shower? Coming from a kitchen & bath designer ... 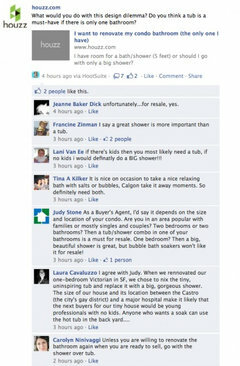 I would scrap the tub and go with a decked out shower; ceiling mount shower head, wall mount shower head, hand shower, body sprays & a steam unit. 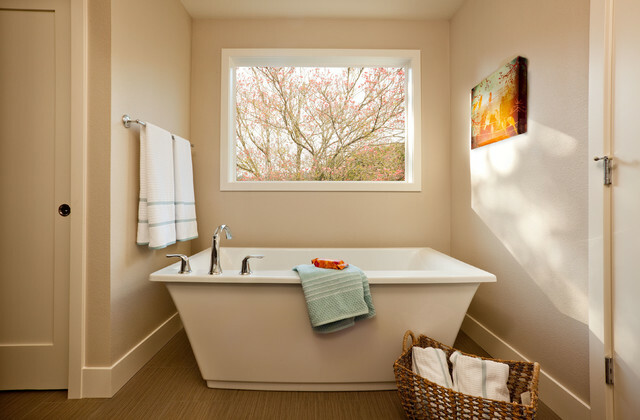 If you're concerned about having an alternative water source you can also add a tub spout at typical spout height. It's a nice option if you need to fill a bucket or soak your feet. How wide is the vanity? Do you think we could do this with 72 inch vanity? We have 88" of space, similar to above Q. Is that enough width to do this style? 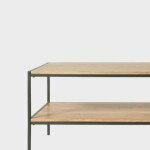 The double unit that we purchased is just over 56" wide and seems quite roomy. For those in the UK we got ours at bathrooms and more store. 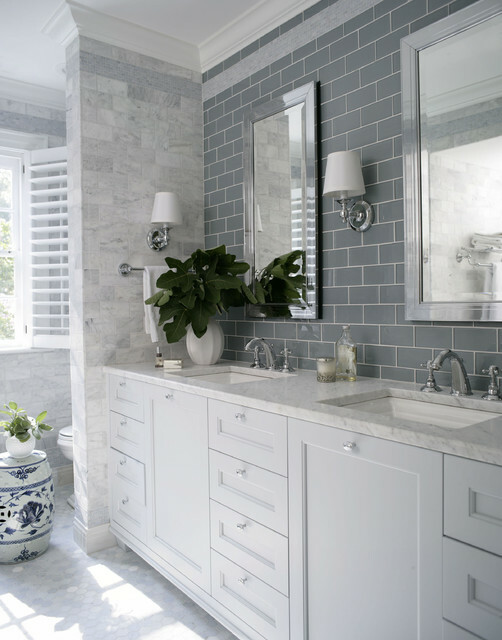 Thank you - this is my inspiration bathroom and we have the exact amount of space available to build it. - Who makes the vanity? What color was chosen for the walls? There are three steps involved hanging the light fixtures in the bathroom. The three steps: 1. Need a electrician to install electrical boxes. 2. Mirror company to cut an opening for the sconces; then hang the mirrors on the wall with glue. Lastly, you will need again, an electrician to wire the light fixtures and secure them to the electrical boxes and mirrors. Walla .... 'It is beautiful'. 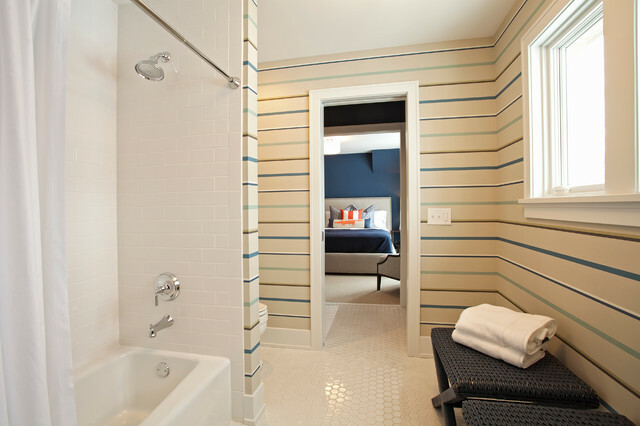 Just a note about the color Vapor-238 on the bathroom wall - it is made by the paint company "C2", not Benjamin Moore. (BM Vapor is a beautiful creamy white). Who makes this console? 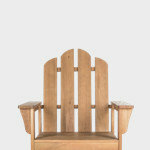 I need it for my remodel. These are custom-designed / custom-built cabinets. There is a store locator on C2paint.com, however, Arizona is not represented. I am assuming there is a vent since there are no windows. I hate having to open windows and close it every time i shower. It brings in cold air and its no fun when you want to shower at night. We have no vent and our window is mostly out of necessity to vent air. We opted to install shower farthest from window for that reason. Why do you want to add a window if there is no other way but up? I like the windows for scenery if there are great views outside and still offers privacy, but not if i only see skies, i'd prefer a skylight. I have two bathrooms with no windows so I did have to go up! 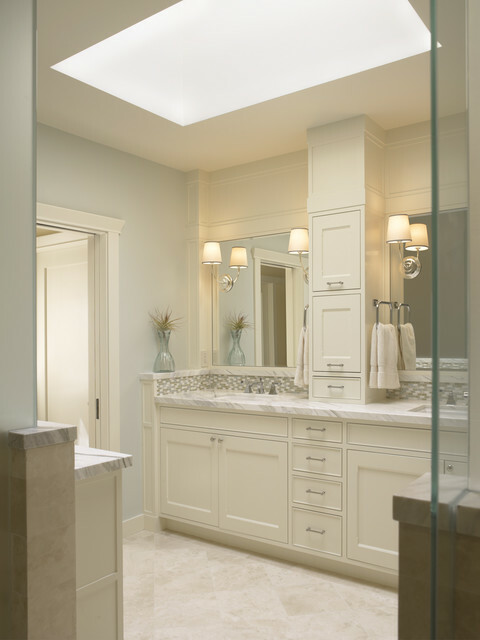 I put skylights in the ceilings of each and love them. Mine are Velux and open by a motor. In addition I have shades between the panes of glass which are also power operated and if it starts to rain, doesn't matter if we're home or not, a rain sensor closes them automatically. I've had no problem with leakage but you do need to keep your room well ventilated during showers so as to eliminate the possibility of condensation. What is the wall color & brand? If you click on more info right below the picture it brings up the green stickers with the info. Would like information on the overhead lighting, please? Correct, it is a skylight. what are the two cupboards in the tower between the mirror for? This makes so much sense to use this tower for storage. I want to do this in my bathroom. The bottom of the tower will be like an appliance garage to hide the electric toothbrushes, the razor, and the hair dryer. It will have outlets in it. Also, it will give me a place to put towel rings. I have struggled with where to put hand towels because there is no room on the walls for them. This is a great solution for us. Yeah, there is a lot of storage apparent in this bathroom, which goes a long, long way to keeping counters tidy as well. Any chance you can show some pictures how the tower drawers/doors work? Would you by chance tell me the width of the tower?? - I am trying to decide if I have enough room in my bath for one like this, I don't have much room but this one does not look very wide either. Thanks! I'd love to know the dimensions of the vanity & the tower as well. We're playing with two different master bath layout options & one that has the better shower configuration only has a 6' vanity space but the other has 9' but less optimal shower placement. Please give dimensions of tower. This is my inspiration photo and my cabinet maker is starting tomorrow! My vanity is almost exactly the width of yours and the left side is against the wall just like in your photo. My vanity box will be 96" wide (8') with one more inch for marble to hang over on the right side. We asked the cabinet maker to build a tower like yours but he's saying it should be 20" wide. I think that's too wide. Please tell me what your dimensions are because I think yours looks balanced and I want him to copy it. Thanks! 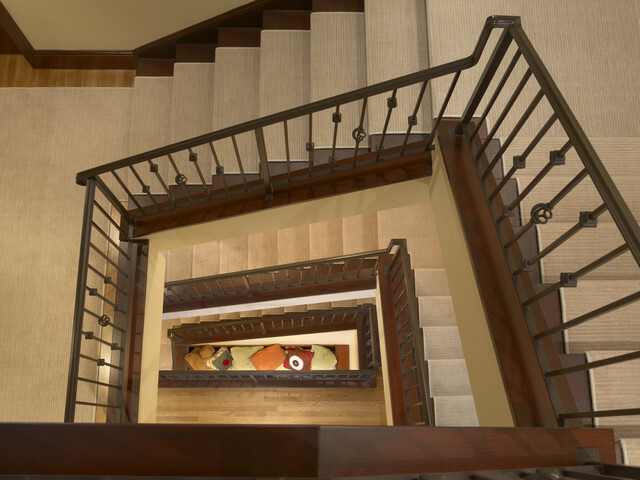 - what type of floors are these? Is French limestone pretty common? I am having such a hard time making a decision on shower and floor for my master. My counter is crema marfil so it is pretty plain to coordinate with. I am not sure to use tumbled or cobbled edge tile with it, etc.. This looks like travertine. It looks like a small tile though, like less than 12 x12. 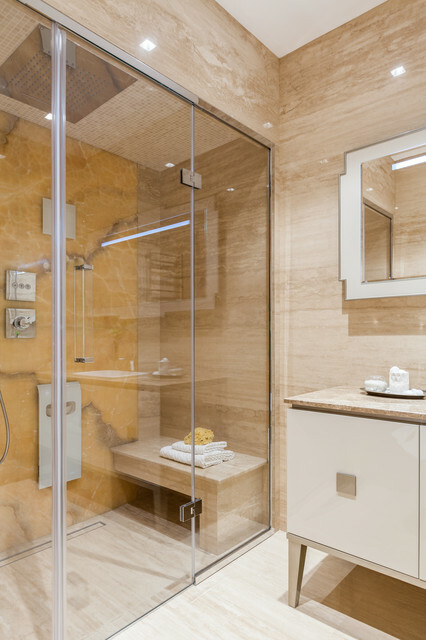 It could be polished marble too, but it looks like travertine. 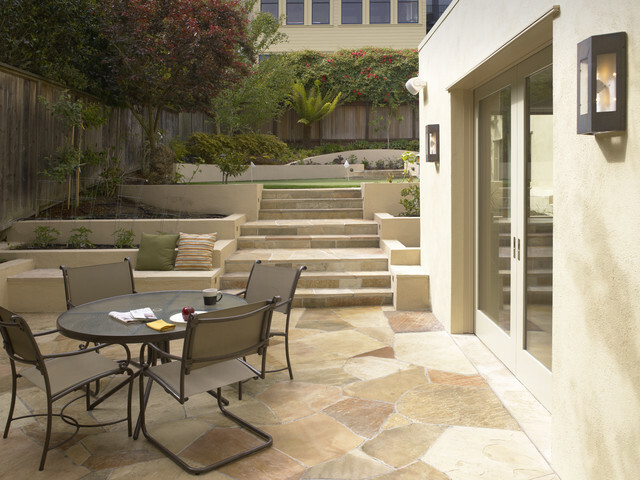 Be careful buying stone flooring. The tone (greenish, yellowish, white) can all vary by lot and the cheap stuff has a ton of filler. - What color is used for the walls and cabinets? It could possibly be Sea Salt from Sherwin Williams #6204. What is the length of the entire countertop? Jen, We did not manufacture this; you most likely found it in our ideas book. Sorry about the confusion. 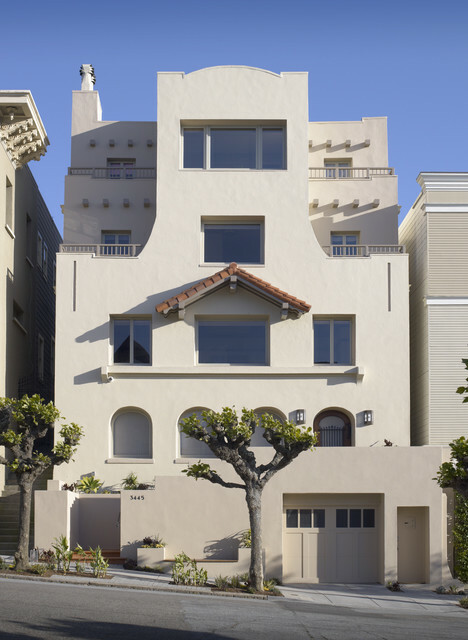 I would go to Gast Architects for the dimensions. The vanity overall length is 7'-9" (not including the 5" backsplash return visible at far left. - What is the name and brand of the wall color? Many more details about this image, including paint color, can be found under the green tags after you click "More Info". How do the tower doors open…up? - I hate clutter on the vanity. how do i build a cabinet to hose the clutter? i am dealing with 133 inches and considering top mounted sinks. Thanks for your question. 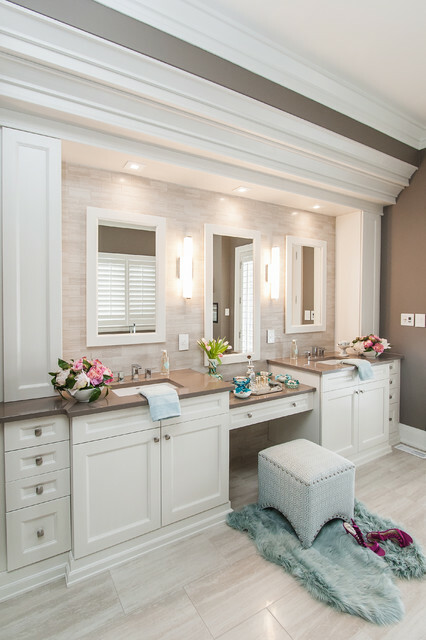 It is a beautiful bathroom and full of storage options. 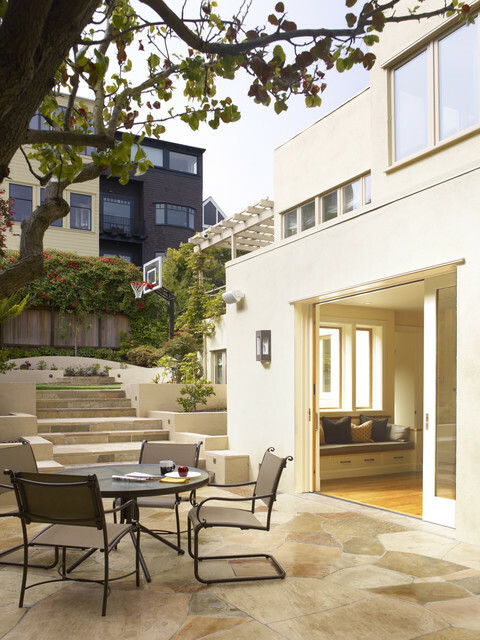 You will have better luck directing your question to http://www.houzz.com/pro/gastarchitects/gast-architects. They designed the bathroom and have the answer. Can anyone tell me if sconces can be mounted on already installed mirrors? - Would cutting into the glass break it? Thanks! Depending on the type of mirror, it might be okay. However, it is really hard to do. If you try to attempt this make sure you have a professional do it after surveying whether it will be possible. I have sconces mounted on my mirrors - so yes! - What colors of paint are used? Benjamin Moore's Lookout Point is a similar color. - Is the paint color in the wall in shade of green? In what exact shade is it? A similar color to try is Sea Salt 6204 by Sherwin Williams. green she asked? really? green? - Who is the manufacturer of the lighting fixtures? Please click the "More Info" link at the right under the picture. Numerous items in this bathroom can be found specified there by scrolling over the green tags. The most reliable answer to your question will come from a marble supplier. - Whats the paint color? What color are the cabinets? White? Dove? Linen? 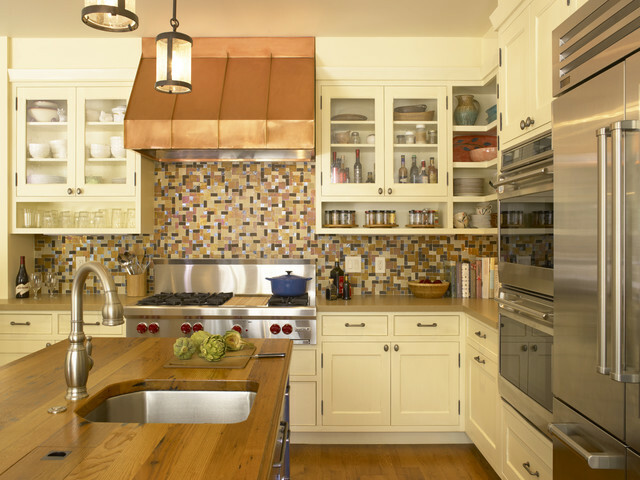 - Where can I find this backsplash? Many more details about this image, including backsplash information, can be found under the green tags after you click "More Info". - How much do the upper cabinets cost? All of these cabinets were custom built for the project, I'm sorry to say that there isn't a direct source or price quote for it. Flooring? What color and make? Many more details about this image, including flooring information, can be found under the green tags after you click "More Info". - What is the overall length of the vanity? Thank you! What is the width of the center tower? Thanks! This is such a great bathroom. Beautiful materials and full of light. 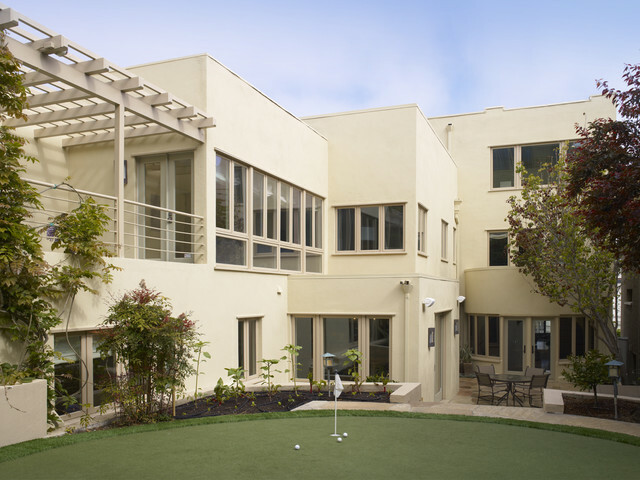 I would direct your question to the architects http://www.houzz.com/pro/gastarchitects/gast-architects. They know the details and...... how to design an awesome bathroom. How do I stack a top load washer and a front load dryer? - Small laundry room, would like to stack if possible. 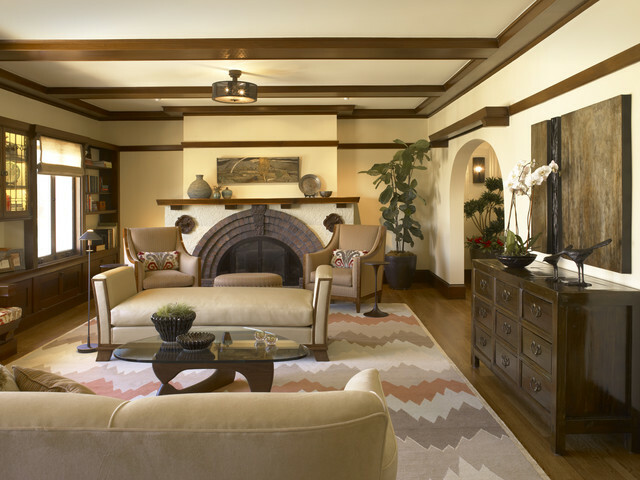 Is there enough light from those sconces? What tile was used in the shower? 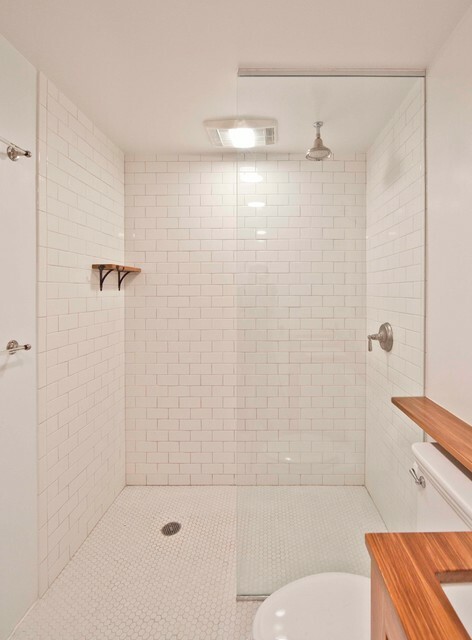 also would like to know about the tile in the shower, please. 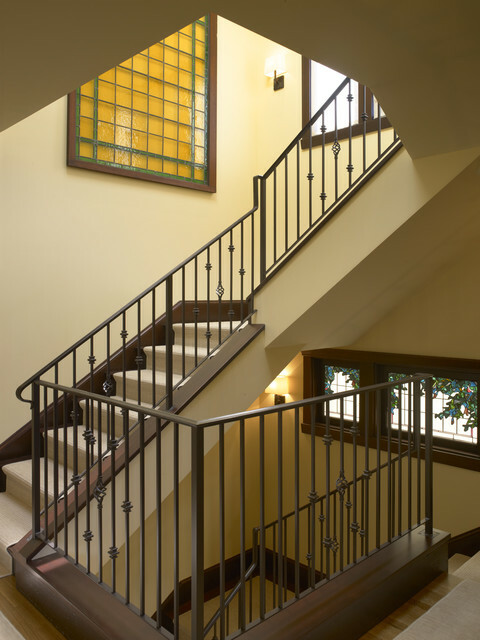 Is there a "rule" regarding how high on a mirror or wall sconces should go? - These sconces seem placed a bit high to me. 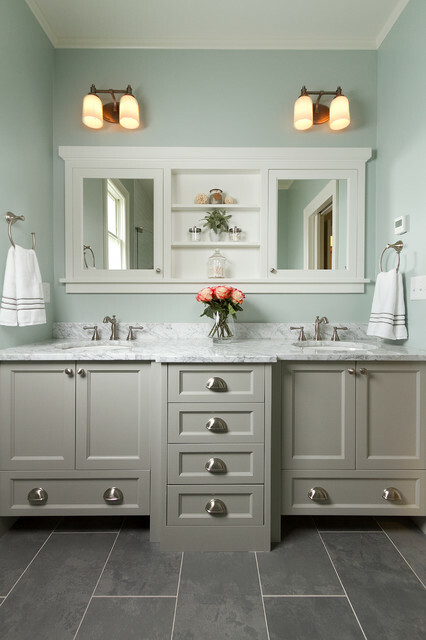 I thought the light portion of a sconce over a vanity should be about or slightly higher than average eye height. 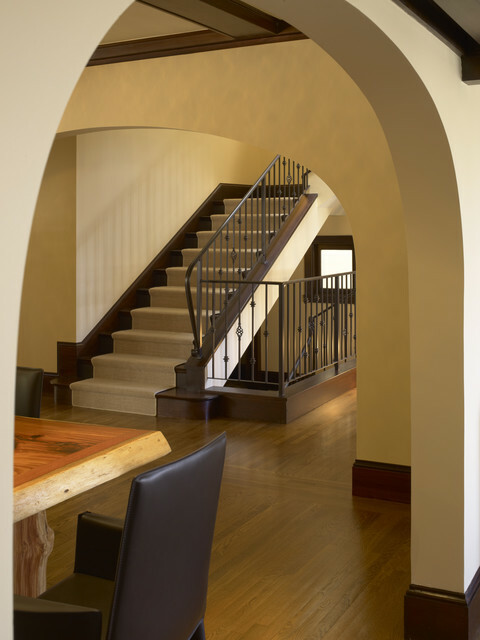 I would also like to know what height to place sconces similar to these. Terrific job. What is the make and model of the knobs and handles? What is the make and model of the handles and knobs? Also, who is the manufacturer of the tile floor? Do those tower cabinet doors open as a regular cabinet or do they open up and slide back? - Who is the manufacturer of vanity? Can it be purchased on line? 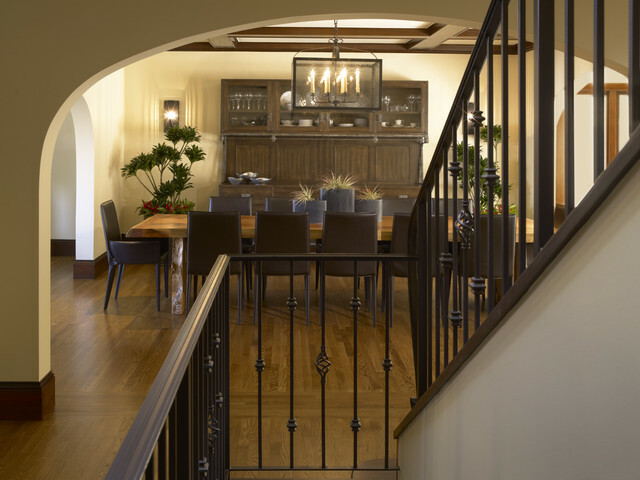 Sconces are by Visual Comfort....you can buy them from circa lighting. 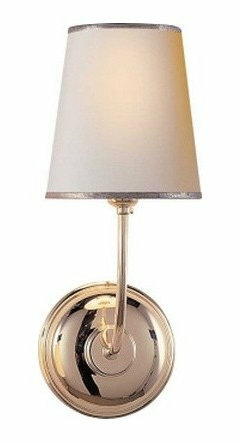 It's the vendome single arm sconce in polished nickel. 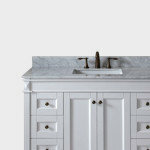 - what is the vanity top? marble or granite? Valspar's Woodlawn Dewkist is a similar color. - From what store or can't he color be created from all stores? - How can there be no picture and where can I find one? This is the first backsplash I have truly been interested in! Hahaha! Is it better to frame mirror before or after it is attached to wall? 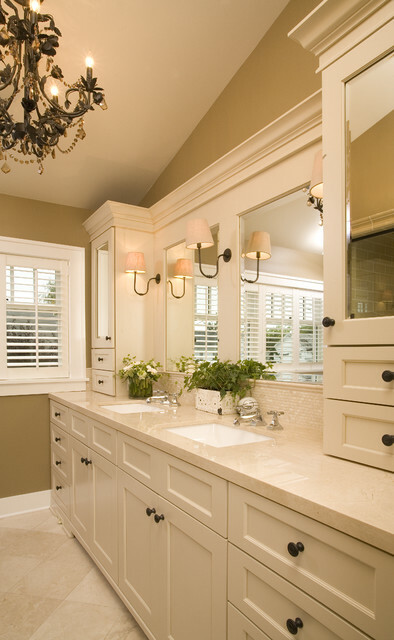 - I am have two mirrors made to fill a 37" wide space above a double vanity. I don't know if I should frame the mirrors and then attach or attach and then frame. I plan on mounting sconces to the mirrors, one on each side of each mirror just like your photo above. How high & far in from each edge should I mount sconces on mirrors? - I have a double vanity split with a tower very much like your photo. I have 37" width on each side of the tower that I want to fill with mirrors. Each mirror will be framed with 2 1/4" frame. - What is the distance between the sconces on center? I have a 30" vanity and don't know if I can fit them. Do you charge by the foot? If so, how much? Is this Benjamin Moore wall colour? 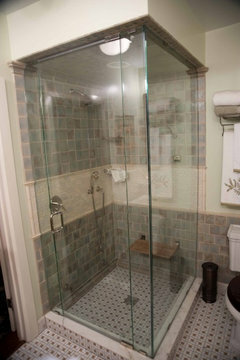 How were the towel rings installed into the upper cabinet? - I realize vanity is custom made, but would like to know the size / width of the one in this picture. Thank you. - Is flat finish pant and or Matt finish are the same? Any details available on the cabinet pulls? Love them! Great bathroom! Hi, do you deliver this to India? - How is this vanity? What's the source and style of the knobs and pulls? 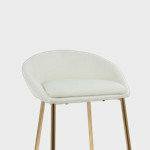 - Would like to use in our new bathroom but need the style name and manufacturer. Thanks! - Could you tell me what material is the panel around the mirrors made of? Is that wood? comment décorer les portes blanches de mes armoires? The counter is it Calcutta Gold or Statuary ? What is the width and height of the tower? How high are the ceilings? - Hi what is the height of the backsplash please? THANKS! what type of wood was used for the vanity and the mirror frame? Do those vanity door lift up and slide in? - I saw a picture of a revolving bookcase in a living room.. But can't find the picture now... Thanks! Can you tell me the handle pull maker please? - What material is the countertop in this bathroom. What color is it? DO you have any other photos of this bathroom? what paint color was used on the cabinets and trim? can I see the shower for this bathroom? I'd also like to know the size of the top cabinet. 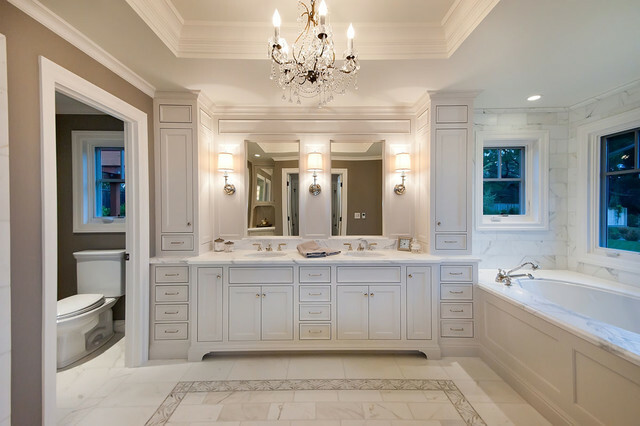 Are the sconces mounted in the mirrors? - What color is the bathroom tile? - Does anyone know the cabinet and wall color? - What are the dimensions of the vanity? 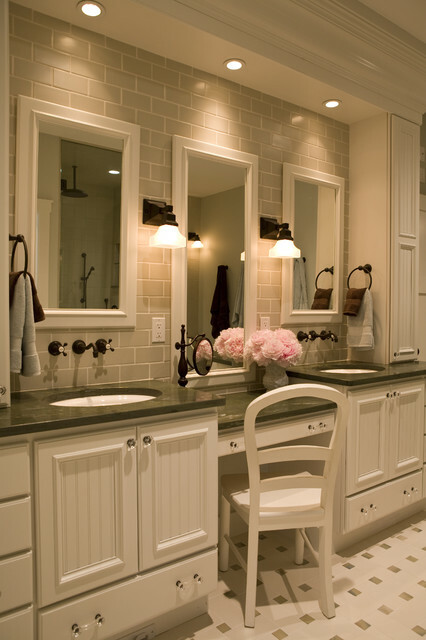 - What kind of accent tile is above the vanity? Thank you. Amp the storage. Take a good look at your bathroom. Are your storage options carrying their weight? 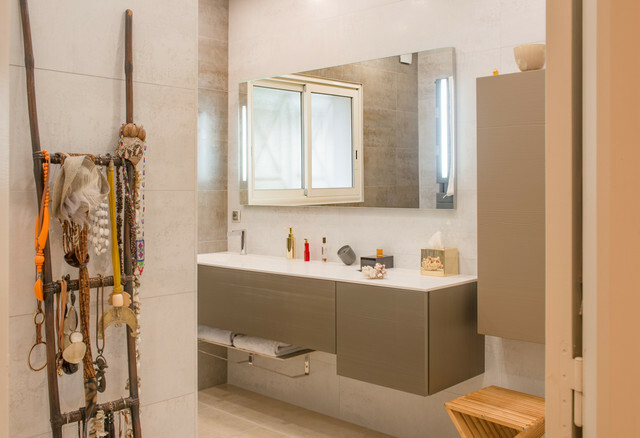 If you’re renovating, make storage one of your top priorities by thinking of all the ways you can sneak it in, such as adding a vanity tower like this. 10. 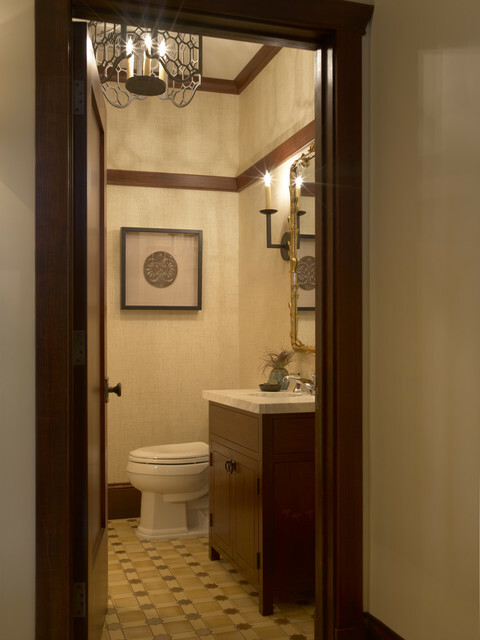 It's the little details that make this beautiful bathroom stand out. 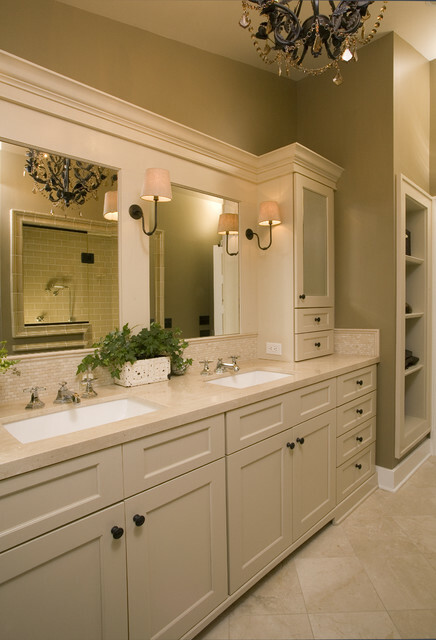 There's a lot of storage in this bathroom's custom vanity. The his and her sinks are divided by several shared storage spaces — a unique but practical touch. 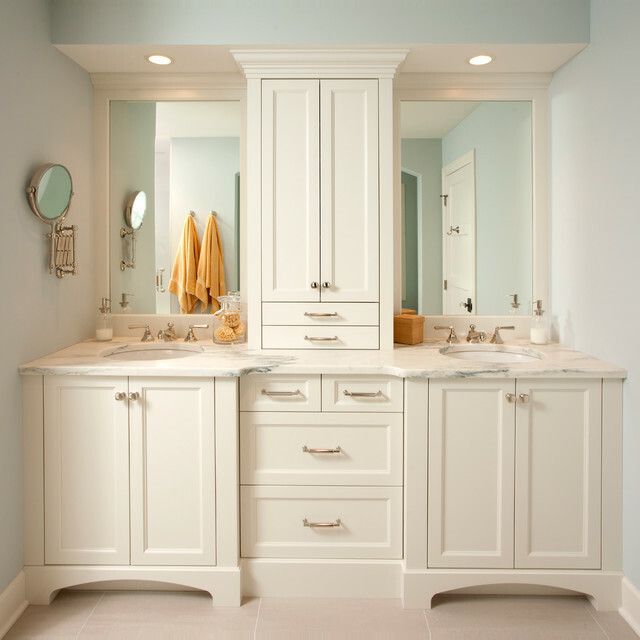 Ideally, you’d install a vanity tower during a remodel (or new construction) so it could be perfectly integrated with your vanity and overall bathroom layout — but it can be added to your bathroom even years later.To add one to an existing bathroom, order it from the company who made your original vanity, or have one built to match. 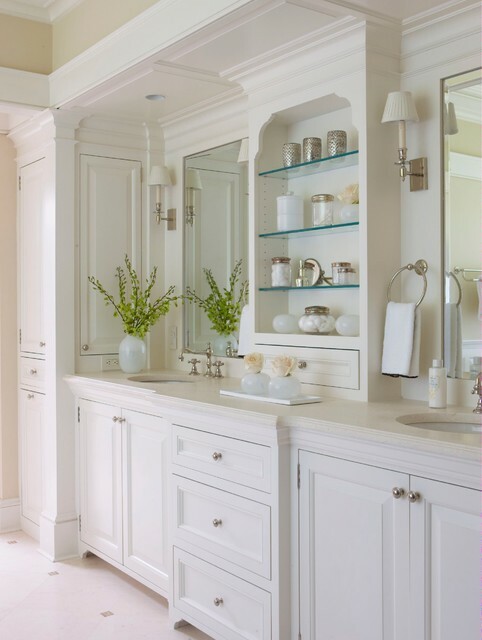 I like the hand towel placement on the center vanity medicine cabinet!